There’s Sekeping Tenggiri and Seapark Brickhouse. Now we have Terasek Brickhouse. The concept remains and they are cosy places with rooms to let. Not just any kind of room, but one that’s all about going back-to-basics, without foregoing style. The minimalist concept is a refreshing change from the regular hotels peppered all over town. Terasek Brickhouse is a fusion of ideas from the previous two places. There are a couple of unique touches. For example, there’s a 4-feet deep dip pool. 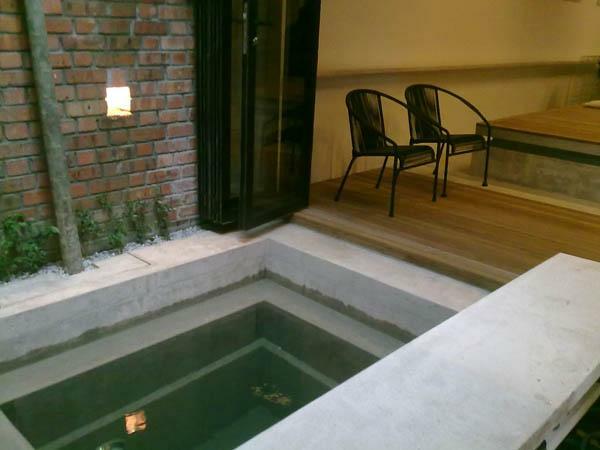 Alternatively you could just sit and stick your feet into this pool and wet your feet. The usual comforts are still available. Air-conds, TV, WiFi, kitchen, etc. There are 2 rooms on the ground floor and three on the upper floor. Another point of differentiation is its rooftop. 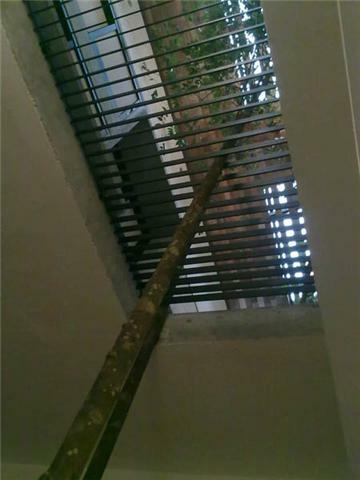 The cement stairs leading to the rooftop is as unique as they come and do watch out for your head when you go through the rather low and small “door” to the rooftop. There, you are treated to a view of the Bangsar skyline. Barbeques can held here too, or perhaps you can do some star-gazing here. There’s a clothes-drying space and you will notice the rather hard-to-miss solar panel on the roof. 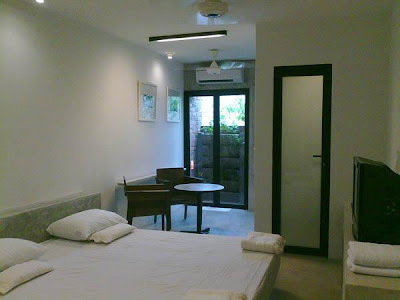 The rates per room per day are RM180 (Sun to Thu) and RM200 (Fri & Sat). 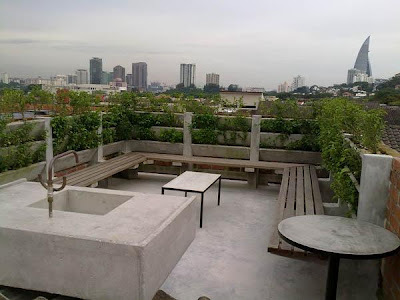 The place is very close to the heart of Bangsar (Bangsar Village, Jalan Telawi, etc). If you are coming from Bangsar Shopping Centre, turn right after Petronas petrol kiosk (on the left) into Jalan Ara. Then turn at the first left into Jalan Telawi. Then turn right into Jalan Terasek. 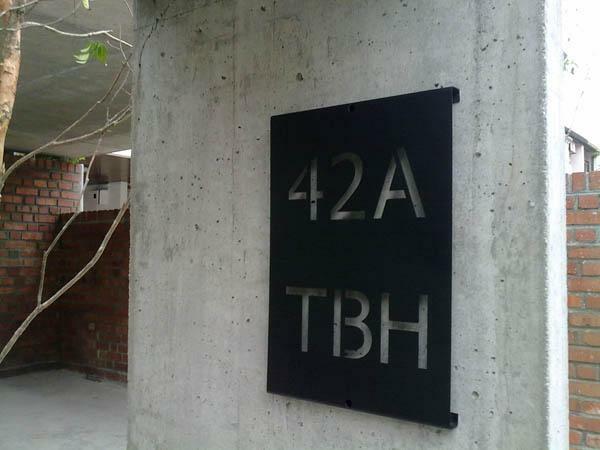 The place is on number 42A. 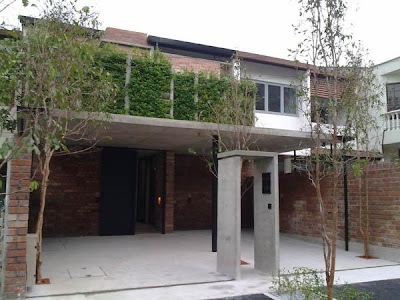 Terasek Brickhouse is perfect for a little getaway in the city or for when you have relatives over! woww!!! i am dying to go there! eventhough its not that far from my house.. i'll get d 'short-distance vacation' someday over there! does it has its own website? i know sekeping tenggiri has its own website..
Only pictures and contact info. I agree minimal is more great place to live.